The Stinger 7 Day Total Detox is a drink designed for those who wish to permanently cleanse their bodies from toxins such as THC, nicotine, alcohol, cocaine, methamphetamines and other pollutants that have accumulated over time and lets you face the future with the confidence that your body is free and clear of any unwanted pollutants. If you don't like taking pills or capsules then this is an effective method for you to rid yourself of unwanted toxins with just a few tablespoons per day. The Stinger 7 Day Total Detox Drink works naturally with your body's metabolism to PERMANENTLY clean your system in just one week. For those who have a high toxin level or whose weight exceeds 230 pounds, it is recommended to DOUBLE the dosage to achieve the desired results. This will require 2 bottles. Stinger's special blend of minerals and Vitamin B2 along with many of the minerals found in sea water will enhance your body's own cleansing capabilities to help purify your system and release harmful toxins. 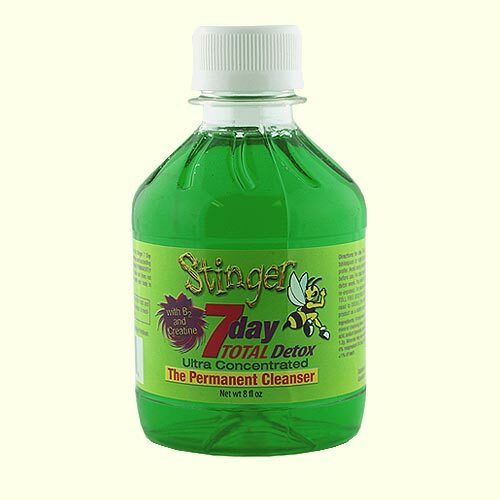 Avoid any toxins for at least 48 hours before taking the Stinger 7 Day Total Detox Drink. Take one tablespoon in the morning and one tablespoon in the evening before meals. You can mix with water or juice if you prefer. Make sure that you are measuring with a standard tablespoon, not teaspoon to ensure that the appropriate amount of liquid is being consumed. You will have a few tablespoons of the liquid left over on the last dosage. You should finish the rest of the bottle with your last dosage.